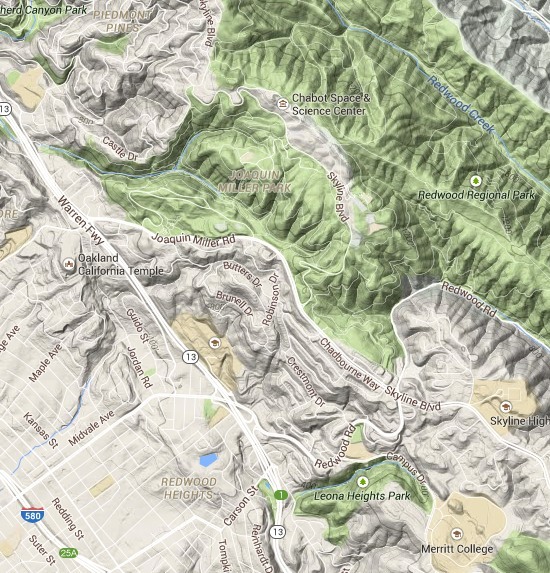 Oakland’s serpentinite patch is the snaky zone shown in deep purple on the geologic map. I’ve written many posts about individual localities, but this is the first time I’ve shown and talked about the whole thing. Here’s the same area in Google Maps terrain view, for reference. The rock doesn’t have a strong expression in the topography, although it tends to support less tree cover. 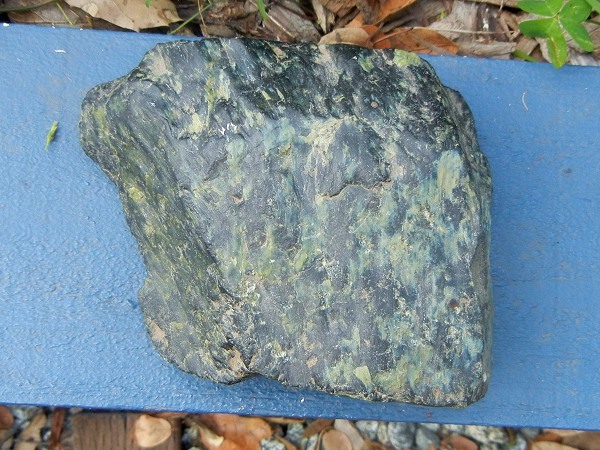 Serpentinite (accent on the “pen”) is a rock composed of the serpentine minerals (accent on the “serp”). Those are three: chrysotile, antigorite and lizardite. I haven’t found chrysotile in Oakland, although I’d be thrilled to: it’s the fibrous mineral used to make asbestos. Antigorite forms at higher temperatures and is often brownish green. That’s not common in Oakland. Lizardite is the shiny, slippery-looking, soapy-feeling serpentine we have. Here’s a typical example sitting by Redwood Road. That color is on the light side of its range in hue. It can sometimes be white, or close to it. On the dark side is this splendid specimen from a Millsmont hillside, what’s sometimes called California jade. Serpentinite is what happens to the deepest rock in the oceanic crust—the dark and heavy material called peridotite—when it reacts with seawater at high temperature and pressure. That is to say, large parts of the deep oceanic crust, miles below the seafloor, consist of this stuff. We would never, ever see this rock unless it somehow got lifted up and put on land. Luckily, plate tectonics enables that to happen sometimes. The result is a body of rock called an ophiolite. Russ Graymer, author of the geologic map, classifies our serpentinite patch as part of the Coast Range ophiolite. The Coast Range ophiolite is a little older than Oakland’s Franciscan rocks underlying Piedmont and surroundings. It’s not pure serpentinite by a long shot, but the name is a good shorthand. The Coast Range ophiolite is strewn up and down the Coast Range in dribs and drabs. The experts are still working out its story. 2: Joaquin Miller Park’s Visionary ridge is serpentinite, and the body extends south to Butters Canyon. 3: Joaquin Miller Park has a small body of serpentinite separated by a thrust fault from body number 2. It’s exposed in the Friends of Sausal Creek nursery. 4: The biggest area of serpentinite encompasses an area from upper Joaquin Miller Road to the Crestmont area and, over the ridgetop to the east, Serpentine Prairie (I and II). Its long tail running past Merritt College is a part I have yet to explore. 5: A long, narrow strip of serpentinite extends down to Lincoln Square. 6: Another long strip extends from the belly of body number 4 across Redwood Road, including Old Redwood Road. This entry was posted on 4 May 2015 at 8:00 am and is filed under Oakland serpentinite. You can follow any responses to this entry through the RSS 2.0 feed. You can skip to the end and leave a response. Pinging is currently not allowed. Nice inventory of the outcrops. And thanks for the definitions. Just calling it all “serpentine” will be a hard habit for me to break, but I’ll try. My appetite whetted by my visit to the Old Redwood Road(cut), I went this morning for a walk at Serpentine Prairie (see, they call it that, too). I looked for and found some chrysotile for you. It is not abundant as it is in many of the deposits over my way (Fairfax), but I did see a small seam about 8 mm thick off the Dunn Trail. I could fluff up the asbestos fibers with my fingernail. There is also a lot of the bright blue stuff like that on Old Redwood Road; again, I don’t think it is blueschist, but it is exactly the same color. Maybe it was blueschist but has been altered by weathering which seems quite advanced in these outcrops. Also found: Ticks. Be mindful of them if you walk off trail. Thanks again. Cool! I’ll try to get up there myself soon. I think the Presidio clarkias may be blooming early this year, with the drought. I’m seeing jacarandas in bloom around town, seems like a month ahead of schedule. Just finished reading McFee’s Assembling California, and I live on Brunell so your posts on Serpentinite were very timely. We used to be amused by people who chose to build on that slippery rock. The area you mentioned where Burdeck joins Butters and upon where now a house sits and where you cite Serpentinite I found crumbly grey dust and blue rough, light stone that crumbles. Where can I go to get rocks identified,? – OMCA is useless for geology. 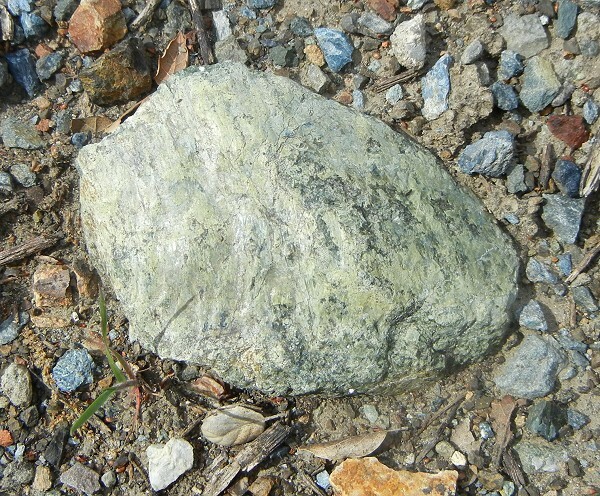 But on the barren area on Crestmont that is posted ( no trespassing/biologic area) I picked up a piece I believe to be Serpentinite – yellow green, dense, slick, and so shiny it looks as tho it had been varnished. Wouldn’t have found it without the pictures. Regarding the maps you post – is there a directory of the abbreviations? I am a novice, Franciscan I understand but Jb,Kjf Kjk are meaningless and I would dearly like to know what they mean. Read your your posts all the time and count on the words and pictures to guide me through. Gen, the map comes from the government, copyright-free. 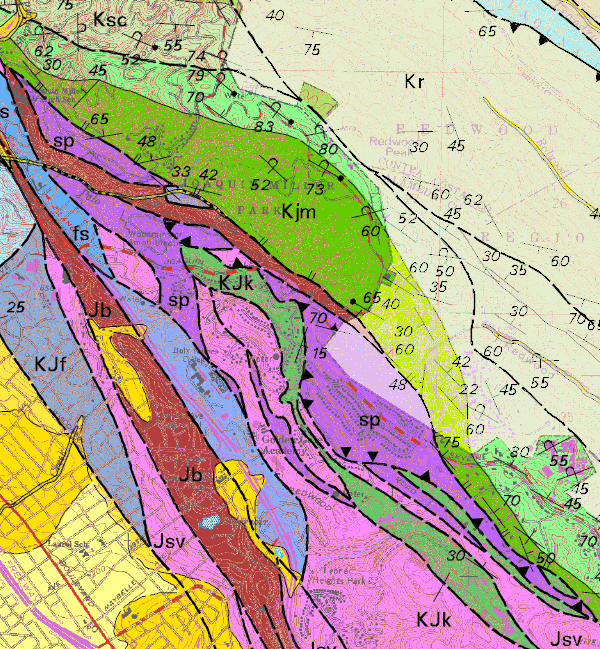 Look on the “Geologic map” page for the source.